Monday - Afternoon, staff meetings and stuff. Evening, information desk. Tuesday - Morning, run registration for Miss Pattie's two sessions of toddler storytime (we're going to limit attendance at the door which is going to be a hard transition for people). Afternoon, children's desk and a few hours on the information desk. Wednesday - Preschool Interactive, early afternoon outreach, late afternoon children's desk and tween/teen herding. Friday - Morning, We Explore (new program that combines storytime and other stuff). Afternoon, depends. Some days I will be at the children's desk, some days at the information desk, or if I'm working Saturday I'll go home. So far, this is what I have lined up for We Explore - fall storytime, monster storytime and costume swap, color storytime with painting, Kohls' Wild Theater, Welty Environmental Center, 3 Healthy Snacking multicultural programs from Miss Pattie, and I'm talking to an education person from the Ice Age Trail, fire chief about doing a fire safety program, appliance store for a big box program, and I still have a few slots to plan storytimes for! Our cataloger is going to do a teen book club once a month on Thursday nights. She did this at her previous library. I'm going to do the publicity for it and hope for the best. Miss Pattie will also be doing her twice monthly evening storytime and a monthly family game night. I already have one daycare signed up for three visits a month - one on Wednesday, two back to back on Thursday - for their 4k classes. I have a remote collection set up with another preschool. I'm hoping to have the biggest preschool bring 100 kids to a couple of our big We Explore programs. I will probably get some school visits/tours from the two elementary schools and possibly the Catholic school and I'm going to make a concerted effort to have them come on Thursdays. I have 2 special programs, a homeschool meet and greet on a Tuesday evening in September and a cookie decorating program on the last Saturday of the session in December. We're also going to do 1,000 Books Before Kindergarten starting in September. This year, I've divided everything into "sessions" and tried to put in natural breaks. So the fall session is September 10 through October 26 (school here starts on the 4th) and then I have a week off (at which time we'll have our huge craft fair fundraiser, which I'm on the committee for this year). The holiday session runs November 5 through December 15, with no programs the week of Thanksgiving. Then I have system committees and meetings, my ALSC Committee, Cybils I hope!, and whatever additional outreach and projects happen. I'm going to finish off July's nonfiction reviews with an old friend and a perfect storytime read-aloud. In the simplest of language, Sayre introduces children to the food web. Leaves fall from the trees, forming muck at the bottom of a stream. Bacteria feeds on the muck and algae grows. Bugs eat the algae and further break down the leaves and are in turn eaten by larger bugs and other predators, including small fish. 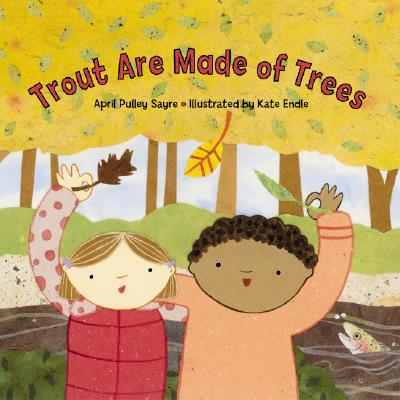 Trout eat bugs and minnows and the leaves become part of the trout. An author's note at the end gives more details on the trout life cyle and suggestions on how to preserve and protect streams. There is also a page of further resources. Kate Endle's mixed media collage has a simple, cheerful look with lots of earth colors and swirling lines. The various creatures are clear enough to be identifiable, but still fit smoothly into the art style. The only other thing I would have liked from this book was an identification guide to some of the bugs - they're listed in the text, but it's hard to tell which is which. Verdict: This is a great nonfiction title for fall storytimes about leaves. It would also make a good base for a science program on life cycles. Definitely one you should have in your read aloud nonfiction sections. A little bit of news first - I've created a new blog for my snippet posts, Flying Off My Bookshelf. If you want to measure how fast I read and see random reactions to everything from board books to adult fiction, take a peek. I'll be gradually moving those posts over to the new blog. Monday - I cleaned off my desk! Had a staff meeting, met with our tech services librarian to plan a teen book club for the fall, and worked the desk in the evening. Tuesday - A fairly busy morning at the children's desk, then 120 people came for our last Storywagon - a sort of bubble/science program. I was scheduled at the front desk afterwards, but our tech services librarian showed up, so I went back to the children's desk because quite a few of the 120 people were still milling about. Worked on cutting down my August order list (started out $1500 over budget. Got it down to only $200 over) and various other things. Both my desks are practically clean now! Went home and answered emails. Wednesday - Had an unusually quiet and attentive group for Preschool Interactive. I was not surprised when many of them asked for brushes to go with the glitter fingerpaint! Spent quite a while before and after storytime talking with parents - gist of conversation, they love us and we are awesome. Continued to work through my backlog of papers, projects, and plans. Thursday - Still cleaning out backlog on desk. Started poking at backlog on computer. Lego Club (medium attendance of about 45) was enlivened by a suspected gas leak, so we had to open all the outer doors just in case, and then of course there was a torrential downpour. However, all of the younger children found standing at the open doors to see the rain a fascinating pastime, so it worked out ok.
Saturday - Yay, working Saturday. The air-conditioning wasn't working. It wasn't too busy, everyone was over at the summer festival. What is left to say? I rarely read - or review - sequels and I've been making a determined effort to limit my series buying this year. But sometimes I come upon something that's just so good I can't resist! While I usually roll my eyes at prequels, sequels, etc. to classic novels, I really enjoyed Andrew Lane's Death Cloud, first in a series of novels about a teenage Sherlock Holmes. The mystery was rather easy to guess and I did think the cover, featuring a Justin Bieber look-alike, was awful and I didn't end up buying it. This book is even more tightly plotted and has an awesome cover. What more could you want? Sherlock is still living with his aunt and uncle, still getting occasional lessons from American Amyas Crow, and still uncertain about his feelings for Crow's daughter Virginia. However, when his brother Mycroft arrives with worrying news for Crow, Sherlock does his best to help. Unfortunately, things go bad fast and Sherlock finds himself sailing to America with the Crows on a desperate mission to save his friend Matty and prevent another Civil War. Along the way, they'll meet giant blood-sucking leeches, an insane John Wilkes Booth, and have some hair-raising experiences with trains. The author's final notes link up several events with later plots of Holmes' life and expands on various historical information, also adding a bibliography. 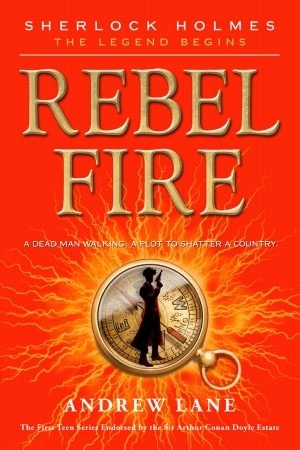 Verdict: This is a fast-paced, excellent adventure story with the additional lure of historical information. The plot works much better than the first title in the series and I'm eagerly awaiting further revelations about Holmes' family secrets. This one will be popular with strong middle school and teen readers. I'd especially hand this one to guys who pride themselves on their reading ability and enjoy intricately plotted stories with an historical bent. There's quite a bit of violence, but also discussions of ethics and morality. The back blurbs on this lovely new graphic novel say Pearson channels Tove Jansson and Hayao Miyazaki and I can think of no more serendipitous blending. 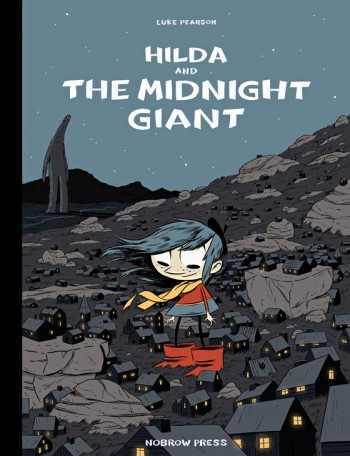 Hilda, a charming blue-haired girl lives with her mother in an isolated house which they both love. But it's quickly apparent that not all is well; mysterious tiny notes are threatening to evict them and are soon followed by an attack on their house. Hilda determines to save the home she loves and make friends with the tiny, invisible elves who are threatening them. Along the way, she meets many other strange and wonderful creatures as well as introducing the reader to some of her odd friends. The pure imagination of this story charms the reader from the first page. There are hints of folklore and legend, romance and tragedy, humor and pathos, all delicately mixed into Luke Pearson's lovely art. Warm earth colors and carefully laid out panels take the reader through a Moominesque world, where strange creatures appear and disappear and characters break into philosophy at just the right moments. Most of the adventures happen in the soft, dark world of night and it's easy to see the odd, friendly and unfriendly creatures, populating a Miyazaki film. Verdict: This has a broader appeal than the Moomin comics and while it won't interest children who like fast-paced action, adventure and slapstick humor, it's the perfect title to hand to an imaginative child who wants to lose themselves in a fantasy world. Somehow I missed reviewing this one when it first came out, but better late than never! This was one of my school booktalking titles this spring and I used it as part of my "older kids should read picture books" spiel. Me: "How many of you like to read picture books?" Me: "How many of you think picture books are for little kids?" Kids: chorus of agreement, degree of sarcasm depending on age of children. Me: "Well, if you don't pick up picture books you are missing out. First on some really cool books, but secondly on a lot of awesome nonfiction because many nonfiction books look like picture books"
I then turn the pages of the book and talk about reading nonfiction and finding interesting books to a chorus of ohs and ahs as the kids watch the pictures unfold. So, like his earlier work, Redwoods, Coral Reefs starts with a kid in a library. It's a pretty stern looking reference library too. But as she opens the pages and starts reading about coral reefs, the images shift until she's in the coral reef, watching the teeming life she's reading about. Finally, she slooshes her way out of the library to share the book with her friends. Additional information at the back explains more about coral reefs and the threats facing them. An author's note includes websites and further reading and the endpapers are decorated with labeled sketches of a variety of reef inhabitants. This isn't really a read-aloud work, although children of all ages will enjoy the stunning illustrations that shift from page to page, plunging the reader (both of the book and in the book) deeper and deeper into the story. The text is arranged in thick chunks, so unless you have a very non-wiggly child this book is best kept for one-on-one examination or for an older child to pore over. 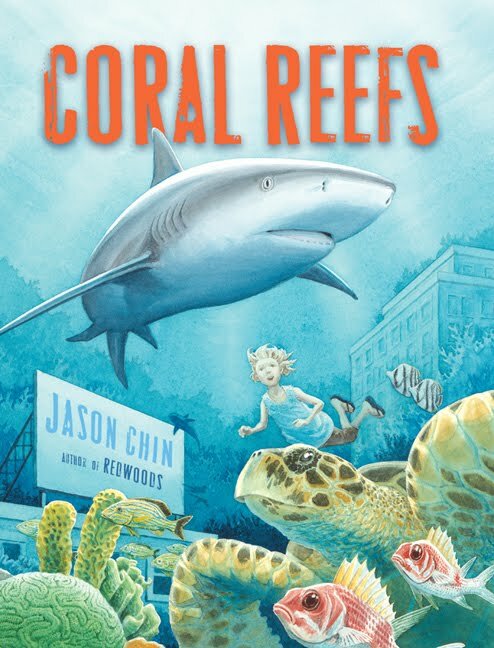 Verdict: A must for your library, Chin's unique style and gorgeous artwork will take readers of all ages into a fascinating world under the ocean. Plus, it makes a great argument for getting older kids to read picture books! I dived right back in to work Monday - rescheduling the kindergarteners tomorrow (too hot to walk), figuring out how to have the Wii pizza party on Friday evening after all, making calls for fall planning, planning the rest of storytime, cleaning off my desk, etc. etc. Very sad to hear of the deaths of Donald Sobol and Else Holmelund Minarik. Encyclopedia Brown has recently had an upsurge at my library and Minarik's easy readers are classics of course. Tuesday morning I did storytime for the kindergarteners at summer school. Eh, could have been hotter. I just grabbed a selection of Preschool Interactive books and a stack of butterfly masks. Things were a bit frantic when I came back, and while I was on the phone talking to a possible homeschool speaker for a program in the fall, someone threw up in the children's area. All over the trains. But I was on the phone and then I had to set up for the performer, so someone else ended up doing the cleaning. Mr. Billy was great fun and we had about 80 people, which is really good for a new performer nobody knows. Then I left early to work on the Messy Art Club for August at home. 36 people showed up for Preschool Interactive on Wednesday, which means about 24 kids. It was pretty crowded. The rest of the day was a blur of crazy. I did lend out my Wednesday volunteer and other random kids to help set up the booksale and got a bunch of programs booked for the fall. Now I just have to plan them. Thursday, more crazy. Due to some mess-ups in the schedule, I have gotten scheduled to open for several Thursdays, i.e. come in before 9, but I also stay until 5:30 on Thursdays b/c of my after school programs. Eh, whatever. It was insanely busy and I spent all the spare time and thought I could manage on our increasingly convoluted fall schedule. Not only do I have to schedule my programs, I have to book our large community room through parks and recreation (yes, it's in the library. no, we don't control it. yes, this is a sensitive subject) coordinate programs with Miss Pattie, who does programming at the library, the community room and parks and rec, then call performers to make sure they can come on the days we have the community room, find out they can't, call parks and rec, find out Pattie has the room, call Pattie, call the performer...you get the idea. We had Messy Art Club and the book sale started. It was crazy. I came straight onto the desk at 12 on Friday, then ran some errands, tried to clear some of the detritus off my desk, and then it was time for the Wii Tournament and Pizza Party. This was supposed to be the sort of companion teen program to Girls' Night Out. It was certainly equally well-attended - 17 kids, 15 of them boys, came. We had two wii consoles set up and the kids started playing at 5:30. It wasn't really a tournament, b/c we only finally got our equipment this week and didn't really have time to organize it. The kids were all being really good about taking turns until...one of the Wii consoles died at about 6:30 and most of the kids decided they were bored with Wii anyways. We tried to get a movie going, but that equipment wouldn't work either and nobody could agree on a movie. We ended up spending about an hour playing variations of hide and seek with me shouting myself hoarse, praying nobody got injured, and a couple kids having fun with the Wii. This format - have various projects and just let the kids hang out - worked well with the girls b/c there was a wide variety of ages and most of them didn't know each other. All but 3 of these kids were 11-12, and most of the boys were friends, so there wasn't any intial awkwardness to keep things a little calmer. Each group spends 30 minutes at their station, then they switch. We could have pizza in between or something. Dashiell isn't happy about her family's move to a new town. She misses her dad and blames her mom and her older sister Arica doesn't understand or care. 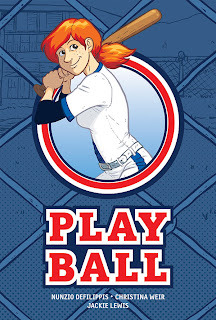 But both Arica and Dashiell are excited about their new school - Arica is thrilled to finally be going to a coed public school and Dashiell is excited about the schools' championship baseball team, the Wildcats. There's just one problem. At Phoenix High School, girls play softball and boys play baseball. Despite doubts from her friends and family and discouragement from the team, coach, and school administration, Dashiell finds enough allies to give her a chance. It's not easy - she spends most of the season on the bench since the coach gives the starting shortstop position she should have had to another player. Her one supporter on the team, Ben (who I think is the captain?) starts dating her sister Arica, which leads to even more drama. 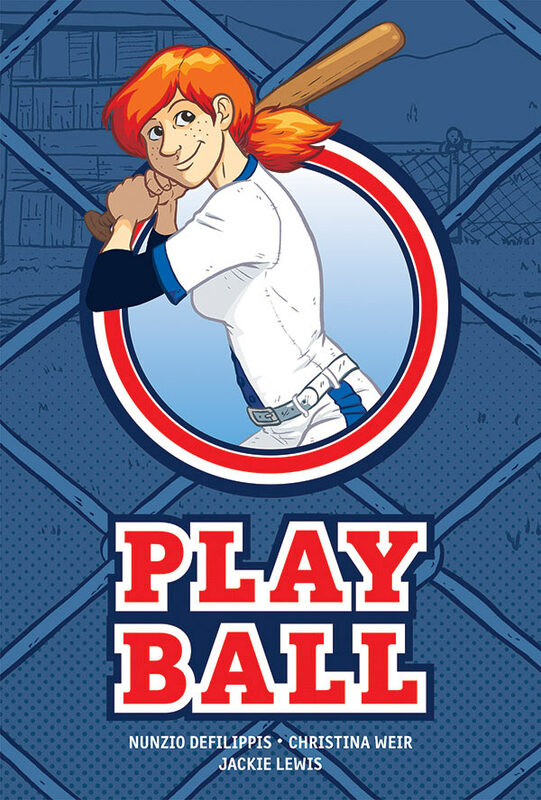 This is an upbeat, positive look at girls in sports - while Dashiell has a rough time initially, her ability eventually wins over the team, even the most negative guys, as well as the coach. Dashiell and the other characters aren't just cardboard cutouts for a story about civil rights though. They have other things going on in their lives - Dashiell and Arica have to learn to get along as sisters even though they're very different. Dashiell learns some hard truths about her dad and grows up enough to admit she's been wrong to her mom. Her teammate Ben, and Arica as his girlfriend, weather some tough spots in learning how to deal with relationships. Jackie Lewis' black and white art is clean and attractive. It captures the movement and action of the sport as well as the emotion in the various characters' interaction. Even non-comic readers will be willing to pick this one up and will be attracted by the variety of characters and plot lines. As always, Oni is optimistic in the matter of recommended ages (this is the publisher who suggests Courtney Crumrin for ages 7 and up). They've labeled this All Ages and while there's only a couple mild references to swearing (Dashiell swears at the principal, but her words are jumbled and her sister says "effin" leading Dashiell to respond "Seriously Arica, learn how to swear. It will make your point that much stronger.") this is a story about teens in high school, dating, growing up, learning how to navigate adult relationships and make decisions for themselves and isn't going to be of interest or appropriate for younger kids. I'd give it to middle school and older. Verdict: A strong story, well-written and drawn characters, and an interesting, multi-layered plot will make this of interest to a wide variety of teens. Recommended. I loved the original Polly and the Pirates and although it's not as popular as Courtney Crumrin, I've not regretted adding it to our collection. 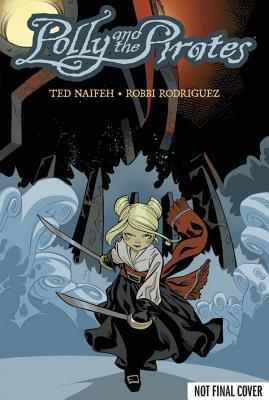 It's sad, odd, beautiful, and hilarious, just like most of Naifeh's work. I was excited when I heard there was finally going to be a second volume, shocked when I found out it would have a different illustrator, reluctant to try it, and finally determined to give it a fair shot. I didn't like it, and I'm not just saying that because of the new illustrator. I didn't like Naifeh's script either. Rodriguez' illustrations don't have the exquisite shading techniques of Naifeh's art. His art is much more reminiscent of manga styles with lots of fine lines and brushstrokes. I hate this, since it means I can't tell the characters apart (yeah, I probably need new glasses, but my place of employment, excellent in many areas as it is, does not run to the heights of vision insurance). I missed Polly's doll-like look and the style of the original volume. (I don't universally dislike Rodriguez, I own all the volumes of Maintenance and I like his work there, but it's much cleaner and less cluttered). I also missed the coherence. While I expect a certain amount of mystical drift from Naifeh, Mystery of the Dragonfish is hardly a mystery, since it has few identifiable characters, clues, or a plot. There are mysterious machinations, political ruminations, and about halfway through it's like the author suddenly said, "oh yeah, there's supposed to a plot, um...yeah...let's throw in some secret plans or something." Verdict: I was disappointed. Others might not be, especially if they prefer the more manga-style art of Rodriguez and like the weird convolutions of Naifeh's "plot". However, the first volume isn't so popular at my library that I feel justified in purchasing the second. I'm expending my Naifeh budget on the colored volumes of Courtney Crumrin. I've complained about how hard it is to find easy nonfiction to read aloud, and now I'm going to lament the lack of really booktalkable (yes, that's a word. As of right now) nonfiction for the middle grade crowd. Specifically for sixth grade, since that's mainly the group I do booktalks for. The books have to be long enough and formatted so they don't look like "books for little kids" (which is a huge problem since most nonfiction books are formatted to look like extra-thick picture books) but they also can't have "too many words". They have to have a hook so I can booktalk them quickly and easily. I'm picky, but so are the sixth graders! This one is an unlikely choice, but as soon as I started reading it I knew it would work. "What's so important to you that you'd risk getting eaten by a tiger, falling off a cliff, attacked by bears, freezing to death, killed by bandits, or all of the above?" "For these daring hunters, the most important thing in the world was...plants!" Anita Silvey tells the story of the men and women who risked their lives, sanity and freedom to collect rare plants. Some of them were stalked by jaguars, went on dangerous undercover missions to steal seeds and plants, or struggled on after being attacked by a grizzly bear to discover a new species of pines. Plant hunting continues today (did you know there's a super-secure vault for seeds?) along with its dangerous and adventure. Be prepared to add botany back to the curriculum after kids read this one! The book is illustrated with historical photographs and botanical drawings and includes notes, a bibliography, illustration credits, and index. At a little under 100 pages it's brief enough not to discourage struggling readers and has a nice, readable large font. 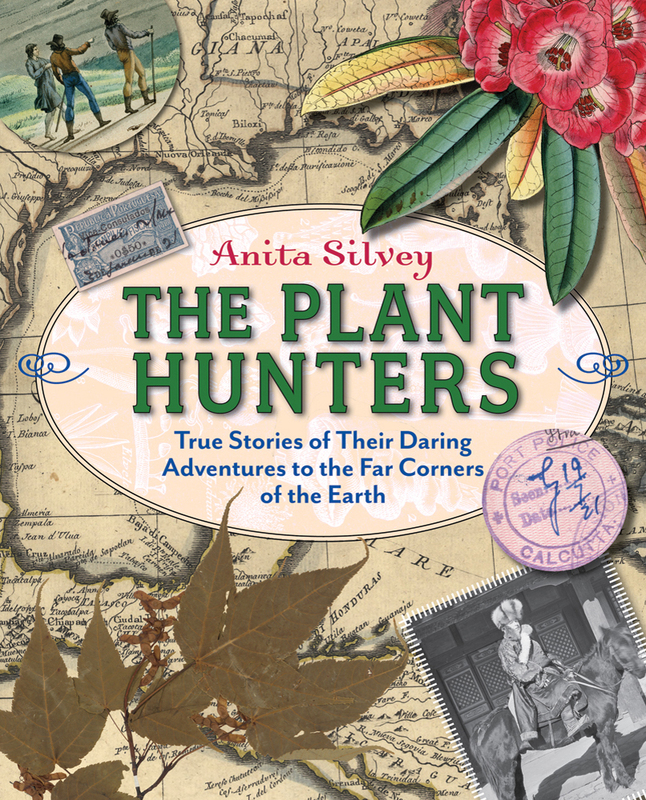 Silvey packs an astonishing amount of information into the pages of these book, from historical botanical expeditions, biographical sketches, reflections on the environmental impact of plant hunting, and botanical and scientific information. Verdict: This is an unusual subject, but with some catchy booktalking it could be a very popular nonfiction selection for middle grade readers and might even inspire them to try a little botanical research of their own. On Tuesday our gate broke during storytime in the morning, but hopefully someone will donate another before all the happy wanderers escape. We had our second Storywagon in the afternoon with an old favorite, David Stokes. Best attendance ever, 200! 50 of them were a daycare, but it's still an awesome number. Maybe I should have live bullfrogs at my storytimes...I got a really good setup for the room that allowed everyone to fit in comfortably (mostly). It's the second session of summer school, which has fewer attendees, but my Preschool Interactive is still pulling level at 35. Quite a few new people, and a few old friends as well. Spent most of the afternoon making book bundles. Time-consuming, but that's how I get those awesome circulation numbers! Lots of babies Thursday morning and no gate! Oh the horror! However, we survived. Mid-sized crowd, 40, for Lego Club in the afternoon. Closed on Friday - traded this out with another staff member who was properly grateful, although I spoiled it by pointing out that I had closed pretty much every Friday for the first two years I worked and really didn't care that much. I have no life. Plus, it's nice to start a little later the day after a late afternoon program like Lego Club, since I often don't leave until 6. Lakeland Animal Shelter joined us for the summer reading kick-off. A number of children and parents enjoyed meeting the friendly dogs. We now have a fish tank, maintained by Christopher Wells. It’s been a great attention-grabber, especially pulling people towards the reading suggestions on the bulletin board. We currently have approximately 420 children participating in summer reading. I'm finally getting seriously to work on my to read pile...from ALA Midwinter 2011! This is a slim chapter book, just a little over 200 pages, but it's packed full of emotions and evocative language. 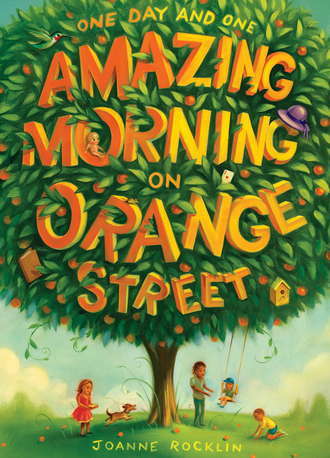 Throughout the course of one day and one morning the reader meets a variety of characters who live on Orange Street. 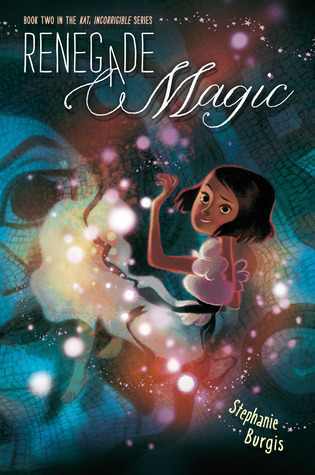 Ali, who fights with her bossy friend Leandra and worries about her little brother Edgar, recovering from major surgery. Manny, Edgar's nanny, who gives advice to Robert who has a crush on Ali. Their elderly friend Ethel Finneymaker who grew up on Orange Street. Ethel's old friend's Larry and Pug, whose father was killed in Vietnam. One of them might be the stranger who has returned, putting the orange tree in jeopardy which leads to a brave action by Bunny, who worries about her mom. As you can see, the focus of this story is on the connections that exist between the people in the neighborhood, the long-ago residents, and possible newcomers. All of these different stories are entwined around the orange tree, the last orange tree on the street which once was an orange grove before the houses were built. An author's note gives some historical information about the orange industry in California, a little background on some of the historical settings, and a recipe for ambrosia. Simple black and white pencil drawings decorate the story, marking out chapters and separating the voices of various protagonists. The story builds slowly with warmth and feeling, but doesn't shy away from painful emotions - the death of Larry and Pug's father, Robert's worries about growing up and the disintegration of his family, and Leandra's resentment of a new sibling. Although it never falls into the "all kids are the same throughout history, they just wear different clothes" fallace (which I hate) it does show links between the various kids on Orange Street dealing with issues and struggling to handle change as pre-teens. 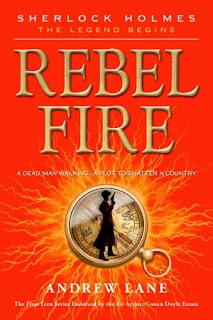 Verdict: This isn't likely to appeal to readers looking for action or detailed historical fiction, but if you have kids who enjoy character-rich stories where the setting is so strongly built it's a protagonist in its own right, you might have an audience for this title. I rarely read or review past the second book in a series, but these are so much escapist fun that I just had to revisit them again. The basic rule of the Extreme Adventures series is that anything that can possibly happen - will. 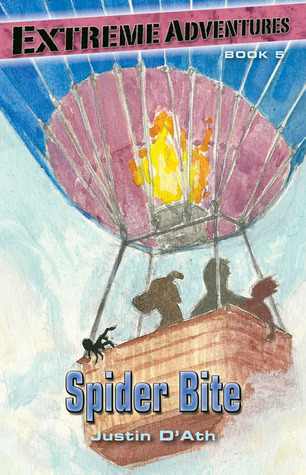 So, in Sam Fox's fifth adventure, Spider Bite, he starts out by helping some stranded balloonists, which leads to him getting trapped in a balloon with his twin five year old brothers Harry and Jordan, untrained Great Dane puppy Myrtle, and a deadly Sydney Funnel Web Spider. When they finally crash land, desperate to get Jordan to a hospital (he's been bitten of course) they land in the zoo, naturally. In the Kodiak bear enclosure. Just to make things more interesting, the balloon knocks over a tree, adding a lion to the mix. Sam's next adventure is even more dangerous, but at least he doesn't have to worry about saving his brothers. Nope, all he encounters in Man-Eater (besides a man-eating leopard) is a spitting cobra, hippos, crocodile, hyenas, poachers, baboons, and Cape buffalo. Of course, he has most of these adventure half-blind, thanks to the initial encounter with the cobra (see, he was trying to escape from an enraged mother elephant and...). Sam even has time to interject a few humorous asides "I don't know what it is about me and snakes. Wherever I go...I seem to run into them." Luckily, Sam has the help of Olki, a ten year old Masai boy who offered to help him get to the nearest hospital. Of course, that was before they were being tracked by poachers, man-eating leopards, and elephants. It takes the combined skills and knowledge of both boys to survive. These books are refreshingly simple. Sam occasionally grumbles about missing his family, or being upset about their move in Spider Bite. His concern for animals is the reason he's in Tanzania and he feels strongly about preserving wildlife. But aside from these few glimpses, the stories really are pure adventure. Every time Sam gets out of one tight corner, he ends up in another. Escape from the leopard? Get trapped by a mad baboon! Crash land your balloon safely? Get trapped by a Komodo dragon! Unlike the usual realistic middle school fare that worries about girls, school, teachers, family, etc. Sam is worried about staying alive and everything else can wait. They're a nice length for intermediate readers and a perfect way to relax on a hot summer afternoon. Verdict: Although the American covers aren't as attractive as the Australian versions, these have been quite popular and I'll continue to add to the series and booktalk them to kids who like their adventure without angst and their survival stories snappy! I'm not sure how I feel about this book. On the one hand, it's a marvelous compendium of research, history and information about the ocean with a ton of awesome activities. It has simple, everyday suggestions of things kids can do to help. On the other hand, it starts out with and continues throughout the book with an endless series of warnings on the ocean's coming demise and destruction. I'm not saying I disagree with these warnings - but I'm always leary of books for children that emphasize the coming destruction of the environment without concrete ways they can make a difference. I find it very odd that many parents and teachers are reluctant to talk to kids about big things like death, religion, or sexuality but have no problem handing over "the world is gonna be horribly destroyed in a few years" books. Ahem. Anyways. After an introduction about the importance and plight of the ocean, the book continues into the sea, alternating between simple science experiments and information about the ocean. There are two sections near the beginning of things kids can do to help (kudos to the author for realizing that not everybody lives near public transportation or owns their own house!). Current events and the aftermath of disasters like the 2010 Gulf Oil Spill are highlighted in What's Happening Now sections. There are also features on The Ocean at Risk. 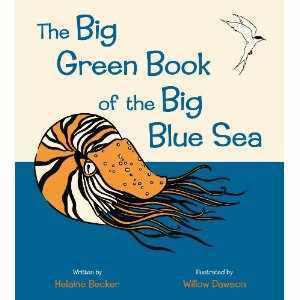 The science experiments, combined with information about life in the ocean, are the best features of this book. They use simple things you can find at the grocery store or in the kitchen and help demonstrate things like how blubber works, what happens when pollutants mix in the water, how fish use camouflage underwater, and how convection currents work. I didn't care for Dawson's oddly retro illustrations - especially her odd people with pink circles on the cheeks - but there are also plenty of photographs to enjoy. The book has an index, but no source notes, bibliography, or further reading. The Good: Lots of ocean facts, great experiments, general positive "things can be changed" attitude, simple ways kids can help, photographs. The Bad: Ways to help stops early on in the book and there's nothing kids can do for many of the problems presented, no source notes or further reading, and I found the cover and illustrations unattractive. This week at the library; or, Planning? What planning? Last year we started taking the week of July 4 as a programming break. I've had several dud programs where nobody came (including a free clogging program where the "audience" was the parents who had driven the kids over and ONE patron and her granddaughter) plus Miss Pattie is off this week, since it's a break week between summer school sessions so I'd have to find somebody to cover multiple storytimes. So, no programs and this is my planning week! I arrived 30 minutes early on Monday, planning to go to the post office. I had discussed with a nearby daycare that they might bring over 7-15 kids, the 8 and up group, to browse and check out books etc. I drove up and saw around 30 kids as young as 5 or 6 waiting to go in. However, I need not have worried. This daycare has superb organization and they had marshalled the children into groups of ten kids and two adults, instructed them firmly on proper library behavior, supplied them with bookmarks to put on the shelves when they took books off, and after about 30 minutes they got the kids into an assembly line at the circulation desk and everyone checked out a book. So, unexpected, but good...but still an interruption. More interruptions later, I got...1 and 1/2 storytimes planned and my monthly report written. Yay. We have had a massive month of June, btw. My attendance statistics (not counting Miss Pattie's programs) were 1050 !!! the children's circulation was up more than 4,000 from May (and is practically equal to the adult circulation, a goal I've been working towards for four years) (who, competitive? me?) and we have over 350 children participating in summer reading. Not just signed up - PARTICIPATING. Woo! I took off Tuesday for a vacation and we're closed Wednesday. Thursday was the Stuffed Animal Sleepover! I also felt really sick, but whatever...I wanted to do something during this down week and thought we'd try this out. Our adult services librarian (and all the staff) loved this idea and wanted to be involved so we had lots of props. I got the idea to make teddy bear tags from one of the Utube videos and had a volunteer make 50 teddy bear tags just in case lots of kids came. I also brought my big teddy bear (imaginatively named "Big Bear") to work because some of the little kids were worried about their stuffties staying all night alone! I started taking pictures at 7 and our adult svs librarian joined me at 8 when we closed. We divided the animals into groups of 5, put a number on their tags and did two pictures per group. Then she set them all up for a couple final group shots while I organized the pictures to go to Walgreens. We left at 9:30pm. Ack! It was fun, but not as simple as I had hoped for our week off program. Next year, we need to add a few rules - only one animal per kid (this was only 2 or 3 kids, but still...) and they have to be small to medium. The four foot tiger was adorable, but difficult to photograph and lug around. And we have to accept that our patrons are insanely enthusiastic and stuff that works at a small library our size where maybe 10 people participate won't work here, where we get about 50 people showing up for anything that sounds interesting. And tell people not to come until after noon to pick them up, so we have time to process the pictures! Friday I worked on uploading and creating a slideshow with the pictures (Angela was the one who got to stay up late last night and send them to Walgreens and pick them up this morning and label them and stuff them in envelopes...). When people came to pick up their animals on Friday, we matched the number on their tag with a photo and they got to take a picture home. Not a bad week on the whole, and we're over the hump for summer so things will be a little more relaxed now. Have you ever really, really anticipated a book...and then not felt like reading it when it came? I adore polite society fantasies, especially those of Patricia C. Wrede and I was breathless with anticipation when I heard that there was going to be a new one by Stephanie Burgis a few years ago. I finally got an ARC of it and...well...it was about a younger girl and I had hoped for more of a teen one and...I didn't like the new cover and title and...I was just never in the mood. However, I am in the midst of a reading slump and my simple cure for this is to sit myself down and force myself to read through my to read shelf. So I finally read it. And despite my original blah feelings, I really loved them! 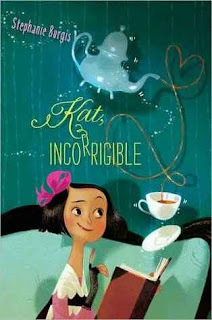 Kat is definitely incorrigible, a bit of a tomboy, and fiercely determined to save her older sisters from themselves and the awful marriages her stepmother has arranged. She's also the possessor of unexpectedly powerful Guardian magic as well as a dose of witchcraft, a most improper and scandalous attribute. Not only does she have to deal with Society's (and her stepmother's) horror of magic, there's her mother's scandalous legacy, a nasty Guardian who has it in for Kat's family, and her useless gambling addict brother Charles. By the end of the second book, all is not resolved, but Kat's older sisters' futures are assured and Kat herself is hopeful that she may have something to look forward to. While these books don't have much of the romance I expect in a polite society fantasy - they are middle grade after all - they have all of the delicious combination of magic, Society, truly awful rows, escapades, and climactic endings. There's a definite resemblance to Wrede and Stevermer's trilogy, with disapproving relatives who turn out to be supportive in a pinch, a useless brother who has to be protected, and a vaguely academic papa among other things, but Burgis brings a different perspective to these characters with her young protagonist. There's a more serious vein running through these books than the light froth of the other polite society fantasies. Kat's magic is frequently fueled by her sense of helplessness. Not only are she and her sisters helpless against Society's prejudice against witchcraft and magic, there's also scandal and family imbroglios to avoid. Some of Kat's night adventures are dangerous indeed with no glossing over the real perils a young, unprotected girl faces in the streets. Kat's vague papa and brother are incapable and unwilling to protect her and her sisters, although her papa does awaken a little towards the end of the second book. Kat's desire to become a Guardian and protect not only her sisters but England itself, is her way of becoming independent of the society that has made her helpless. I think I'm becoming academic, so I'll stop there, just saying that these books have a truly perilous feel running through them, although they're perfectly appropriate for middle grade readers. Verdict: While these may not be the most popular of fantasies, they will certainly find a few enthusiastic fans. Occasionally I like to buy books for the minority (and myself) and these will definitely be my purchases in that area. I'm glad I finally got around to reading them and I look forward to recommending them to girls who like historical fiction, funny stories, a light touch of romance, and fantasy adventures. June has always known that her mom has "special friends" but it never mattered before. June had her best friends Luke and Tina, her pie baking, and her beloved Lake Champlain. But now Mom's friend, Eva, has moved in and since the new civil union law has passed, they're planning to get married. 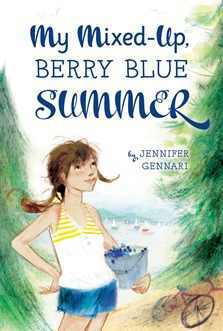 On top of the usual angst of a new step-parent, June has to deal with how she feels about Eva and her mom being together permanently, her longing for a father, and the unpleasant reactions of some of the people in her small town, including her best friend Tina's family. To make things even more complicated, June is starting to wonder how she really feels about Luke and her mom and Eva are fighting about how to deal with the negative publicity. I thought the author did an excellent job of putting all the events into perspective from June's point of view; she's got a lot going on and her emotions are all over the place. She's upset and scared by the negative reactions, but sometimes she feels angry that her mom has put her into this position. She doesn't really like Eva, but she wants her mom to be happy. She's confused by her feelings for Luke and hurt that her friends don't always back her family up. She's embarrassed by the people who want to define her - and her mom - by their lifestyle, both negatively and positively. In the end, June has grown up a lot over the summer, learning more about herself and her friends. She understands a little more how hard it is to stand up to people, she's willing to make allowances for people and compromise, and she's gained new self-confidence. The dramatic endings - June saves Tina's little brother's life with Eva's help and wins a baking competition against 46 other adults - are rather unrealistic, but kids like dramatic endings and at least Gennari didn't stereotype the town's reactions to the events. Am I going to think about community reaction to this book? Well, yeah. We're a public library and we serve the public - that means that the bulk of what I'm going to buy is going to be what the public wants to read. I can think "this is an important topic and we should have a book on it" but that doesn't matter if nobody ever checks the book out. I originally purchased this book for the library not because it was about a girl with two moms, but because A. Julia Denos created the cover, making it a sure winner and B. I can always use more books about baking. While our small town is pretty conservative, I've never had problems with any books we've purchased. A few suggestions to move books to a different area (completely merited - Piers Anthony is NOT always appropriate for teens!) and one problem with a magazine subscription in the four years I've been here. Of course you never know how people will react, but our parents generally seem to be comfortable with the idea that we're a public library and it's up to them to decide what their kids read. I appreciated that the description delineates the plot clearly so we won't have any shocked parents saying they didn't know what it was about. I won't booktalk it unless I know the parent and child well enough to know if they'll be offended, but I think it will easily go out on it's own. Verdict: Even if they aren't in this situation themselves or know someone who is, kids can relate to the emotions about a step-parent and growing up. I loved the descriptions of Lake Champlain and I am WILDLY ENTHUSIASTIC about the very manageable length of this middle grade title. Not preachy, well-written, attractive cover, and a story kids will enjoy. I'd say it's a winner. Recommended! "Every morning, every night, it's milking time." 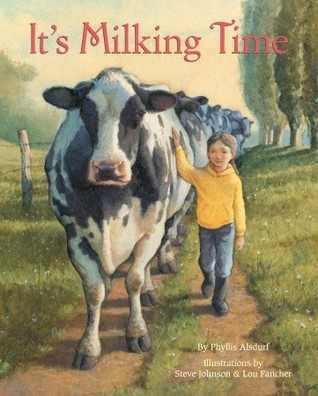 Alsdurf draws on her own childhood experiences to take readers and listeners on a gentle stroll through her memories of helping to milk the cows. Readers see the cows coming to the barns, being fed, milking machines, and what happens to the milk afterwards. This is a very simple picture book, with sweet, peaceful language. Most of the facts are woven into the story - there's not description of how a milking machine works, for example, but we see how it's cleaned and attached to the cows. Johnson and Fancher's illustrations are, as always, warm and glowing. You can see the warmth and love between father and daughter, the peaceful cows, and the beauty of the farm in these paintings. This is a perfect read-aloud for storytime. It includes a few new vocabulary words (stanchion, suction, trudge) and enough information about the milking process for kids to get interested and for parents to seek out longer nonfiction books on milking and other farm processes. I'm assuming from the author's note that the story is set in her childhood, so some of the processes may have changed a little. Verdict: This is the kind of easy nonfiction I look for to read aloud in storytime. Beautifully written, with facts woven into the story and a few vocabulary words to practice saying aloud. I also look for farming books and frequently have trouble finding anything for our quasi-rural community, but this is perfect. Highly recommended.